Miniature oval watercolour and gouache on ivory, set in an oval metal brooch, with thin gold frame and outer border of seed pearls. 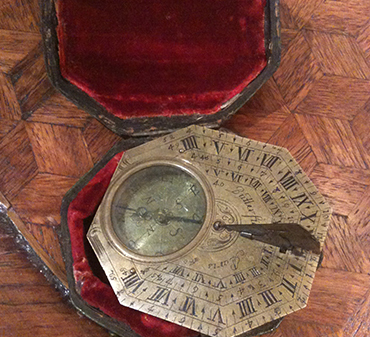 A BUTTERFIELD BRASS SUNDIAL – Signed Butterfield – Circa 1700. In a velvet lined hand painted original leather fitted box. An original 40°- 60° North dial signed “Butterfield AParis”,made by Michael Butterfield, one of the world’s made by Michael Butterfield, one of the world’s eading makers of scientific instruments in the 17th and early 18th centuries, active in Paris from 1675 until 1724. The octagonal dial plate’s four hour scales, declination lines and numerals are engraved and enamelled in black. The adjustable bird gnomon is finely engraved with acanthus leaves and markers for 40 to 60 degree latitudes, the bird’s beak acting as a pointer. The centre panel above the compass is decorated with crossed quiver of arrows and torch. The reverse is engraved with a table of latitudes with the names of cities, predominantly French. Superb craftsmanship and elegant details belie its originality. While in perfect condition, the dial has not been cleaned or polished and maintains its original patina. 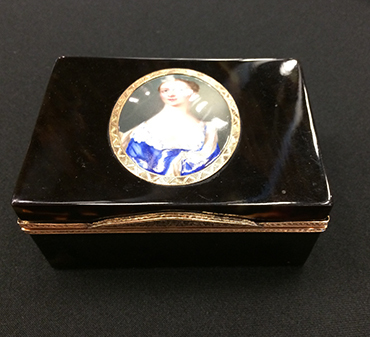 The item is beautifully boxed in velvet lined; hand painted and decorated case to fit. A portrait miniature of a gentleman, wearing blue coat and white shirt, his hair powdered and styled of the period. 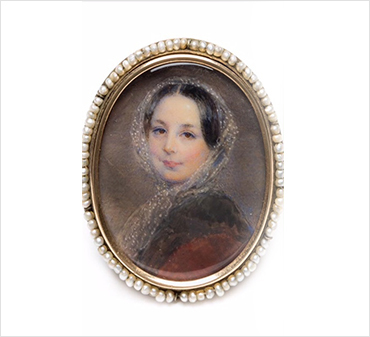 This portrait miniature by Richard Cosway dated from the 1780s, when he was painting portraits to be worn as jewellery or set into boxes. Even on this small scale his masterly prowess is clear, with the folds of the sitter’s frilled shirt highlighted with minute brush strokes. Cosway was the leading portrait miniaturist of the Regency. His most important patron was the young Prince of Wales (later George IV) who he first painted in 1780. During the later eighteenth century he influenced the taste for portrait miniatures among the fashionable elite.